L2 6RE. 10 Matthew St, Liverpool. The Cavern Club. In February 1961, four local youngsters played the first of 272 live appearances, their final appearance in August 1963. The Cavern made The Beatles, their hard-working nature honing their mixture of own compositions and cover versions before well-received audiences. U2 never had the opportunity to play here, but they did play almost directly across the street at Eric’s back in the early 1980’s. Cue April 2019, and the rain is pouring heavily on this city, but that doesn’t stop the fans of U2Baby (www.theu2tributeuk.com) making their bi-annual pilgrimage to the revered building. It’s the bands fourth appearance at the Cavern, and the punters take the long and winding descent into the depths to the main area. Next is a small area selling Beatles and Cavern Club merchandise, before the discrete entrance to the main stage, where a capacity sold-out crowd of 250 fans, inevitably U2 fans in the main, meet and greet each other like long-lost friends. Much hugging and kissing is entailed, many pleased to see each other once again and all excited on the prospects of an unknown setlist. 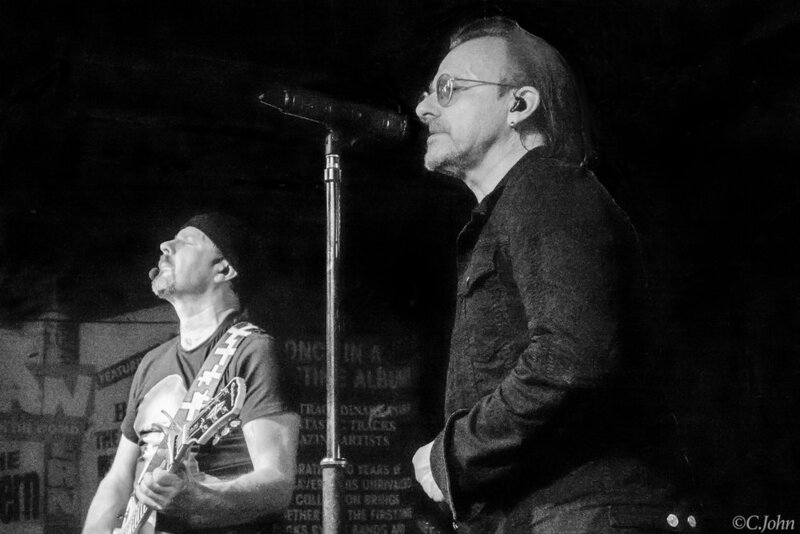 Rumour is there are new songs on the agenda, ones not previously played by the purveyors of all-things U2, and even songs not played that often by the real thing themselves. Shortly after 8pm, the crowd gathers at the stage, the lights dim, and the welcoming sound of Noel Gallagher’s It’s A Beautiful World emanates from the PA. The crowd eagerly turn their attention to the stage, as one-by-one, the members of U2Baby enter the stage. The PA quietens, and immediately the familiar rumbling sound of The Blackout begins. Close your eyes, and you’d struggle to not think you are listening to U2. The bass and drums throb at ease to the rhythm, and the sound is enveloped entirely by “the Edge’s” guitar – it looks like NASA have been appointed as guitar roadies, as a bewildering array of pedals and amps – affectionately known as U2D2 – faithfully reproduces the unique sounds of The Edge. Finally, the singer arrives with his authentic reproduction of the look and actions of Bono, at times even appearing to be more Bono than Bono! He grabs the microphone…”Dinosaur, wonders why it’s still walks the earth, yeah”. And before the audience gets a second to recover, U2Baby launch into another loved song from Songs Of Experience, Lights Of Home which fires up an already ecstatic audience, every word from the song sung at full throttle by singer and gig-goers alike. After the performance of new songs, the band launch into Beautiful Day, swiftly ripping into early classics I Will Follow and Gloria. Within a pause of breath, the next suite of songs are just brilliant. The setlist moves into a brilliant combo of Zoo Station and The Fly from Achtung Baby. Once finished, the next two songs bring floods of tears to many in the crowd – including this reviewer – with beautifully performed renditions of Kite and a truly stunning Stay (Faraway So Close), a performance equal, in my professional opinion, to any performance done by U2 themselves. Closing the first part of the set is a triumvirate of more Achtung Baby songs – Love Is Blindness, Who’s Gonna Ride Your Wild Horses, and Until The End Of The World. It is quite apparent that this band picks live versions of the U2 performances to replicate. In the case of Love is Blindness, the singer turned to find himself joined on stage ZooTV style by an adoring fan. It’s not only the music that U2Baby pay tribute to. It’s fair to say their tag line of “The Sound, The Look and the Attitude” is spot on. A stunning set so far, and a welcome break for audience and band ensues. 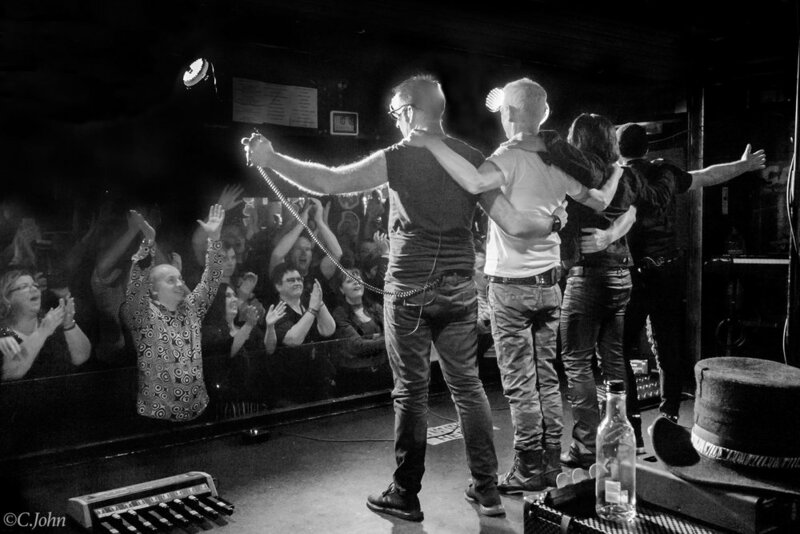 The atmosphere at the Cavern Club is second to none - this is a U2 fan meet not to be missed. The familiar beat of Sunday Bloody Sunday echoes through the Cavern. After a short break, U2Baby return and it’s the familiar beat of Sunday Bloody Sunday that echoes through the Cavern. Moving fast forward almost twenty years, and the beat of Vertigo is next, and then back a decade to Even Better Than The Real Thing and Acrobat, the latter having the full MacPhisto treatment. What follows next are some deeper eclectic cuts, and some new songs, In God’s Country, Red Flag Day (to my ears better than how U2 play it), and Get Out Of Your Own Way. And just when you think it’s safe, the band launch the big guns, starting with a fabulous New Years Day, One, Ultraviolet (Light My Way), and Please before a mass sing-along of Love Is Bigger Than Anything In Its Way closes the end of set two. Within a few minutes, U2Baby return, and a superb choice of An Cat Dubh / Into The Heart and The Electric Co. from Boy are ecstatically received by the audience. Our “Bono” is then seen retrieving a harmonica, and the band duly launch into Running To Stand Still…. and yet again another iconic transition complete with ZooTV choppers and moments later the familiar keyboards and chiming guitar of Where The Streets Have No Name launches the crowd into a frenzied dance and sing-along. “40” - the finale - what a crowd! Next a fine rendition of Bad, complete with Bowie’s Heroes snippet, and the last song is announced: what could be more perfect than to close with “40”, the final beats played by the drummer to the very last, before he gets up and makes a lovely short speech to the crowd in true Larry Mullen style taking us back to the final show of 360 in Moncton. His bandmates return, take a well-deserved bow, and the audience reluctantly leave. Another classic Cavern performance. It may be only the fourth show for them here, but let’s hope there are many, many more! 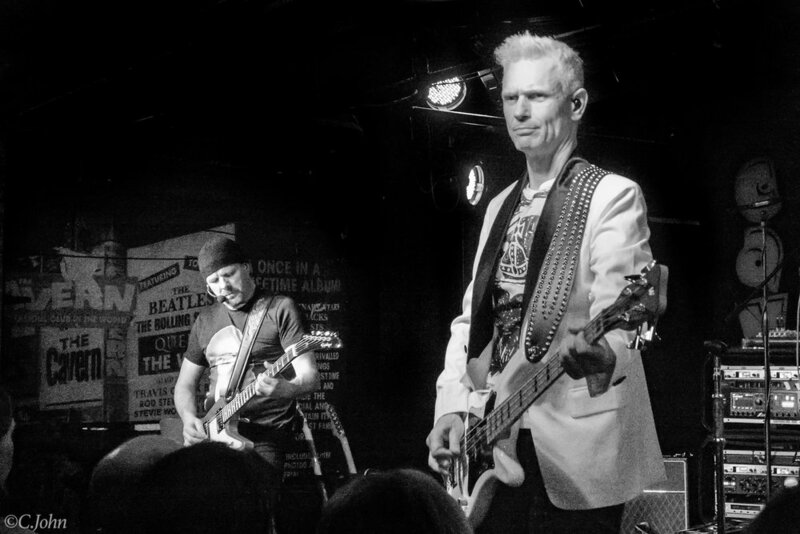 U2Baby will return to the Cavern on 3rd October 2019 and tickets are available here… . they will sell fast so don’t delay in getting yours. We often re-stream our gigs live on Facebook - visit www.facebook.com/theu2tributeuk and give us a LIKE and FOLLOW if you would like to tune in. We are planning to replay the whole of the Cavern show at some point in the near future as time allows.